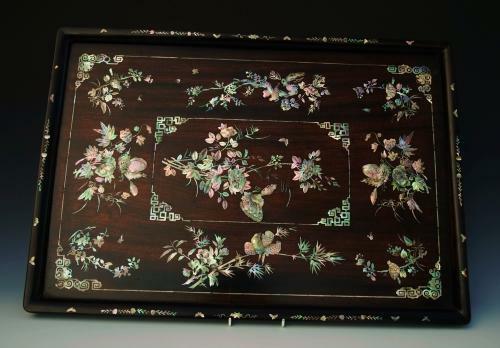 The tray consists of an inlaid edge with leaf and flower decoration and inlaid butterflies. This leads to a mother of pearl inlaid border with key pattern and circle decoration to the corners leading to eight individual inlaid designs including foliage, butterflies and birds in trees. The central section also has a geometric inlaid border with central inlaid design depicting a butterfly with floral and foliate decoration. This tray is in excellent condition, is of excellent quality and can go straight into a home or collection.